Lucidchart is a cloud based diagram editing software that allows you to create professional looking flowcrahrts, wireframe pictures, mind maps and many other types of documents in a collaborative work environment. Flowchart Free Tool! 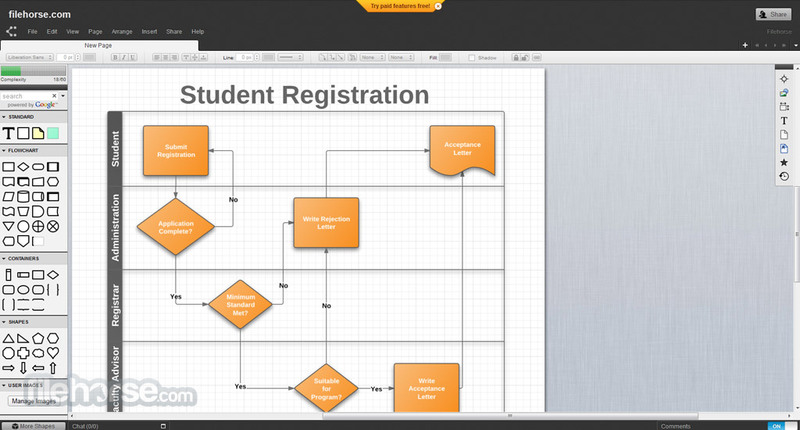 Create excellent diagrams online using collaboration and easy tools! Creating computer document presentations is something that almost everyone does at one point of their life, whether that is in school, home or work. However, as presentation editors have evolved and allowed users of all technical of design knowledge levels to create beautiful, informative, easy to control, easy to share, reach all modern devices and be interactive and engaging, one segment of presentation creation remained vastly under-developed – the ability to create versatile, detailed and easy-to-edit diagrams. If that is something that you need in your daily work or school, then you need to take closer look at Lucidshcart – an incrediblypowerful diagram-editing tool that has managed to implement all power of modern web 2.0 architecture, tools and services directly into the suite that is accessible from any modern browser. LucidChart is an online productivity application that is built with one goal in mind – to provide home users, students and work users with tool that can help them build any type of simple or complex diagrams that can be created simply from inside web browser, either alone or with friends from your team members. Using Lucidcharts users can very easily start building their chart-focused projects from scratch, or picking a starting point by picking one of the almost hundred pre-made templates that cover categories of Flowcharts, Wireframes, iOS Mockups, Android Mockups, Mind Maps, Engineering, UML/ERD, Organizational Charts, Floor Plans, Network Diagrams, Venn Diagrams and Business Analysis. If you want to create your own template, you can also save them in special “Personal” category, which is important for business or student users who have need to access some diagram types regularly and don’t want to waste time on creating their basic forms. What makes LucidChart so well suited for professional and business user is its highly capable editor, which has very large away of tools for precisely managing every shape or object you insert on the plotted work canvas. That includes dozens and dozens of standard objects, flowchart objects, containers, shapes and more. Users can even use integrated Google Image search tool to discover new content that they can simply drag and drop to the work area and then same as with any other object, precisely manipulate it in desired shape or position, connect it with neighbors and create any type of connected chart you wish. Flowchart Free Tool! With service like this, no matter how good secondary tools or features are, users will not find satisfaction when they found that main editor of charts is inadequate. Thankfully that is not the case with LucidChart, whichfeatures excellent editor that can be used for creation of all types of diagrams, both alone and in collaboration with your team members who can join in into your session and help you with larger projects. In addition of working from inside LucidChart’s web interface, this webapp also has full support for working as a Google Chrome extension where can even be used in offline environment. Full integration into Google Apps ecosystem is also present. LucidChart can be used for free (up to 60 objects per diagram, 25 MB of online storage space), but premium tiers are much more attractive. They cost between $3.33/month for one single user and $21/month for team license that can host up to 500 users. 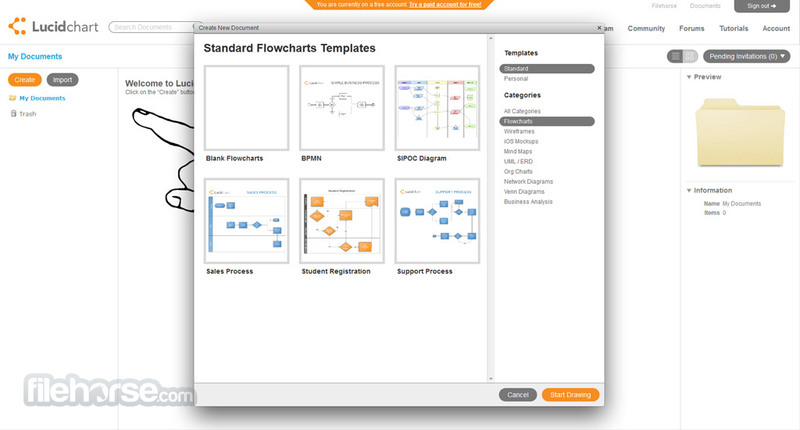 Founded in December of 2008, LucidChart very quickly found planetary fame and enabled everyone from home users to largest brands (NAA, Twitter, Netflix, Disney, Staples, Groupon…) to easily create flow charts, wireframes, mockups, organizational charts and other diagrams of all shapes and sizes. Today, its service is better than ever. Drag and drop functionality simplifies the entire experience. For example, simply draw a line by dragging out from the edge of one object. Flowchart Free Tool! With hundreds of shapes and fonts available, your team will find everything they need. And when you're finished drawing, printing a high-quality PDF or image is just a click away. 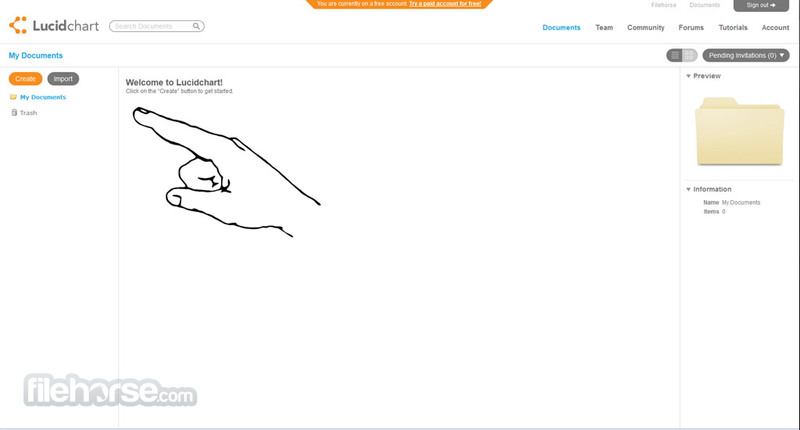 With Lucidchart's high-quality exporting, you can be sure that what you see on screen will be what you get. Lucidchart enables you to invite as many people as you'd like to work with you and to watch their changes appear in real time! Robust revision history lets you see who changed a document, when they changed it, and what they changed. Group chat is right in the editor so you can chat with colleagues about changes you're considering. Finally, embed the diagram in a wiki, corporate website, or blog and it will automatically update as you make changes in Lucidchart. Never worry again about compatibility issues between different operating systems. Regardless whether team members or clients are using Windows, Mac, or Linux, you can now easily work together with Lucidchart. Because Lucidchart is built on HTML5 and web standards, it works on every major browser! Now you can create your diagram on the computer at work, view it on your phone in the cab, and touch it up on your iPad at home. All data is transferred to Lucidchart servers using Secure Socket layer (SSL) with AES-256 bit encryption. There, every version of your diagrams and all of your changes are automatically saved. Your documents are backed up hourly to multiple data centers, so you don't have to worry about misplacing your files or dealing with hard drive failures.